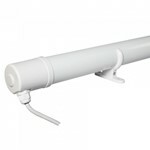 When low-cost background heat is required for domestic or commercial use, these tubular heaters offer an ideal solution. They can be used in various applications, from garages, sheds and conservatories to retail windows and aviaries to help prevent condensation. Our tubular heaters come in various lengths;1ft, 2ft,3ft & 4ft. Voltage is 230V Mains wired.